Source Optimized DNA sequence encoding Human Stromal Cell-Derived Factor-1 alpha mature chain was expressed in Escherichia Coli. Molecular weight Native human SDF-1 alpha, generated by the proteolytic removal of the signal peptide and propeptide,the molecule has a calculated molecular mass of approximately8 kDa. Recombinant SDF-1 alpha is a disulfide-linked monomer protein consisting of69 amino acid residue subunits, migrates as an approximately8 kDa protein under non-reducing and reducing conditions in SDS-PAGE. Biological Activity Determined by its ability to chemoattract human U937 expressing CXCR4 Determined by calcium flux with human U937 cells. Presentation Recombinant SDF-1 alpha was lyophilized from a.2μm filtered PBS, pH.4. Peripheral blood samples at TP2 in EDTA tubes are diluted with PBS supplemented with 2 mM EDTA and 0.5% BSA (v/v, 1∶1); 30 mL of diluted blood solution is then loaded in a 50-mL LeucoSep tubes with 15 mL of Histopaque 1077 and centrifuged at 850×g for 25 min. The buffy coat layers containing white blood cells are collected and washed twice with sterile PBS. Cells are then resuspended in EBM-2 supplemented with 0.1% BSA. 0.5–1×107 cells/mL of cells are loaded onto the upper part of ThinCert™ tissue culture polystyrene inserts (452.4 mm2 culture surface, 3.0 µm pore size , , ) which are pre-assembled on 6-well plates containing medium as above with or without 100 ng/mL of recombinant human SDF-1α or β-NGF , respectively. Cells are then incubated at 37°C in a humidified incubator with 5% CO2 for 18 hrs. Cells from both parts of the transwell inserts are dissociated with Accutase and collected into FACS tubes. Following washing using PBS, migrated and non-migrated cells are stained with KDR-FITC, CD133/2 (293C3)-APC, CD34 (8G12)-PE-Cy7 and CXCR4 (CD184)-PE antibodies for flow cytometry analysis as described above. Receptors involved in the crosstalk between CXCL12 and HER1. 5637 or HeLa cells were cultured alone, or in the presence of 200 ng/mL CXCL12 or 25 ng/mL HB-EGF. TOSE cells are hypermethylated at the CXCL12 promoter (A) CXCL12 RNA levels were measured by quantitative RT-PCR. 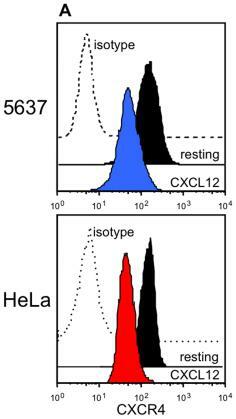 CXCL12 protein levels measured by ELISA (inset).